VOX is Scotland’s national mental health advocacy organisation. We represent your views to Scotland’s politicians and lawmakers to make sure our mental health laws and services reflect your needs and interests. If you have a lived experience of mental health issues – past or present – and want your voice to be heard, join VOX to start shaping the mental health agenda. 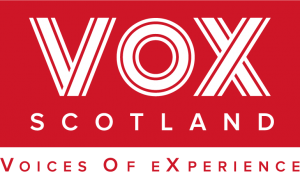 VOX is Scotland’s only national mental health advocacy organisation run by people with mental health issues for people with mental health issues. I was asked by Graham Bowman to design Vox Scotland’s new website with focus on the design and practicality. I endeavored to portray a individual mental health website with a crisp, modern style. The best thing I can say about James is that everything you read in his Mission Statement and Testimonials is 100% true! James is a craftsman in the best possible sense who cares passionately about building great websites and providing an excellent service to clients. He’s fully up to speed with all the latest technology and can explain how this will benefit your site in a really down to earth way. He also has a striking visual sense, so if you marry his aesthetic style with his technological awareness, you end up with really outstanding, highly functioning websites… built at very competitive rates! Couldn’t rate James highly enough and will definitely go back to him for all our IT, website and graphic design requirements.